Police allow hundreds of activists to hurl rocks, eggs and paper planes at embassy, breaking windows and leaving behinds heaps of garbage. Several hundred young activists on Wednesday hurled rocks and eggs at Turkey's embassy in Moscow and brandished anti-Turkish placards after Ankara downed a Russian warplane on the Syrian border. The activists threw eggs, paint and paper planes at the diplomatic mission and broke several windows as Moscow police urged them to stop the protest but did not intervene, an AFP photographer reported from the scene. Some chanted "We will not forget, we will not forgive" and also yelled slurs directed at Turkish President Recep Tayyip Erdogan. Some of the activists' placards read: "Turkey you will remain without gas" and "Shame to accomplices of terrorists," a reference to a statement by President Vladimir Putin, who accused the Turkish government of backing the Islamic State (ISIS) group militarily and financially. Seized documents have revealed Turkey cooperated with ISIS, buying black market oil over the border from it. After the rowdy protest, demonstrators left behind heaps of trash and broken glass. 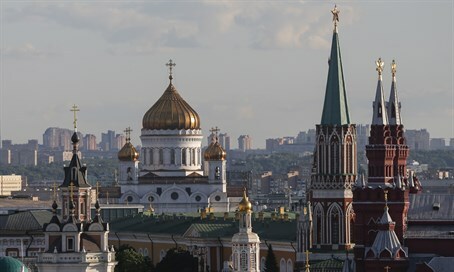 A Moscow police spokesman told AFP he was not aware of any incidents involving the Turkish diplomatic mission and the embassy was not immediately available for comment. Ties between Moscow and Ankara unraveled after NATO member Turkey shot down a Russian warplane on the Turkish-Syrian border on Tuesday, saying it had violated Turkish airspace. Putin said the Russian warplane had not posed a threat to Turkey, warning that the incident would have "serious consequences" on the countries' diplomatic relations.